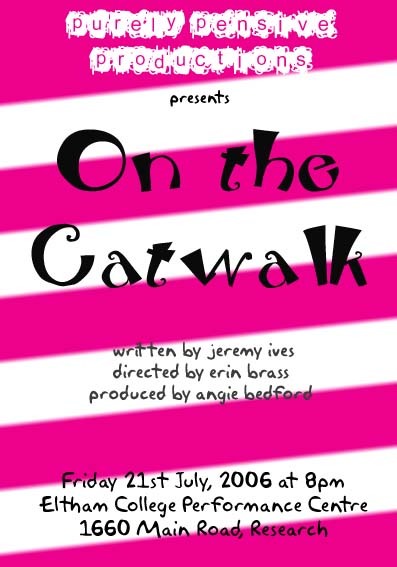 On the Catwalk was performed at Eltham College Performance Centre on July 21st, 2006. The four girls in question all belong to the same agency, Shoop, and are chosen by opposing arch-rival designers Raefe Lauren and Claude Bon Fantasy to appear in their headline shows as they compete for “Designer of the year”. The girls must endure a hard-nosed reported following them around, a snobby male model, a surfer who could ruin it all, as well as a pesky secretary with bad hair! Will they make it down the runway or will their personal lives get in the way?